Can I use this to help predict Commercial Real Estate cycles? I’ve done a lot of commercial real estate, and I would NEVER, not in a million years, ever think about doing ANYTHING in the commercial arena without first checking the local cycle and market indicators, just like we did for residential. Commercial isn’t much different, except there’s an extra string of zeros on the end of the numbers and you probably can’t withstand a bad market or timing error. 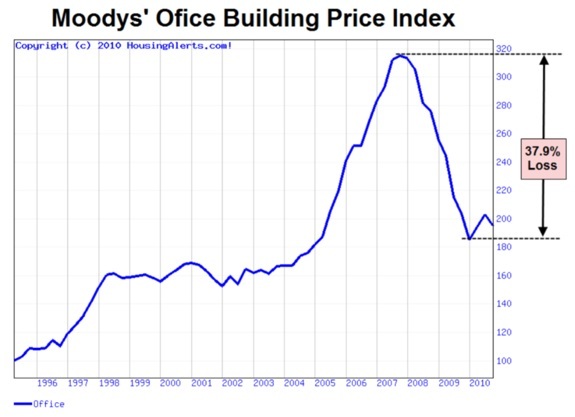 This is a view of the U.S. Office building price index for the last 15 years. It comes from Moody’s Economy.com. Moody’s is a big company you’ve probably heard about. I don’t have anything to do with the data behind the blue line, it all comes from Moody’s. You can see that the value of an ‘average’ U.S. Office Building declined almost 38% between it’s late 2007 highs and it’s early 2010 lows. That’s an extreme loss. No one seemed to see it coming – they missed both the timing and severity of this market crash. The Retail, Apartment and Industrial sectors met similar fates. This is a view of the same blue line – the Moody’s office building price index. Now, take a look at the brown line. That’s my proprietary prediction line. Do you see how it precedes the blue line – the price of office buildings - by roughly 12 months? Do you see how the brown line PREDICTED the very top in the office building market 12 months – a full year before it happened? Do you think there were BILLIONS of dollars in lost wealth that could have been avoided had they known about my brown line? 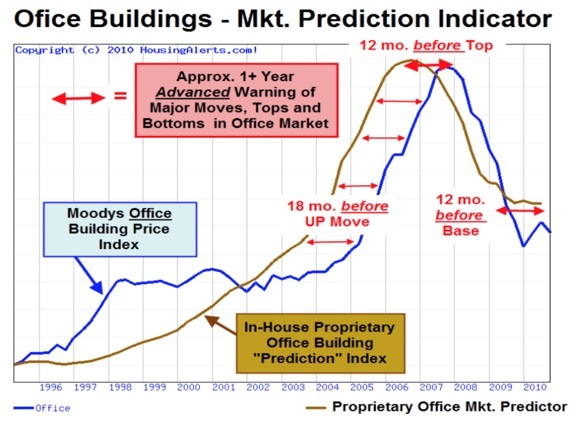 Do you see how, on the up cycle, the brown line predicted what the blue line – the prices of office buildings - would do a full 18 months in advance? Do you see how the brown line declined, then formed a base – months before the blue line did? When the brown line starts to go up sharply – do you think it might be predicting what the office building market is going to do, some months later? 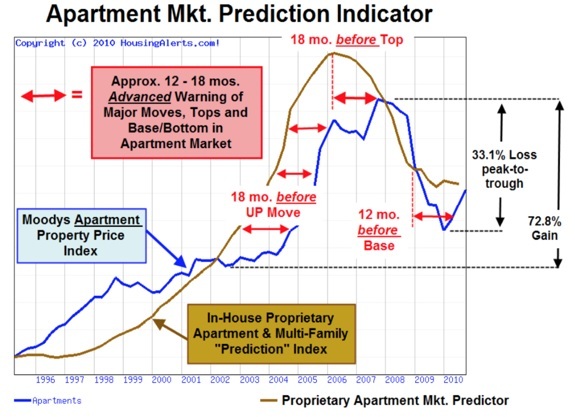 Here’s a similar example of the apartment market cycle predictor (using the HousingAlerts SFR data base). If you understand the chart you’re looking at, then you also get the gravity – the enormity - of this correlation.